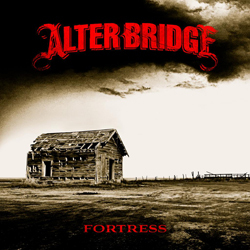 ALTER BRIDGE’s latest studio album, Fortress, is now available in the United States, but has been making waves around the globe since it was released last week to the rest of the world. The album is being released via ALTER BRIDGE Records through Caroline in the US and via Roadrunner Records throughout the rest of the world. The latest release from the rock juggernaut band comprised of Myles Kennedy on vocals/guitar, Mark Tremonti on guitar/vocals, Brian Marshall on bass and Scott Phillips on drums, has been burning up the charts and getting rave reviews around the world. The album has already hit #1 on the iTunes Rock Album chart and #8 on the iTunes Top Album chart. The album debuted in the UK as the #1 Rock Record and the #6 record overall on the charts this week. The album was produced by long-time ALTER BRIDGE producer Michael "Elvis" Baskette, known for his work with FALLING IN REVERSE, STORY OF THE YEAR and INCUBUS, to name a few. ALTER BRIDGE recently played their only US show in 2013 in Orlando, FL on October 4th at the House of Blues. The sold out-show was the band’s first concert in over 18 months and was met with fan and critical acclaim. The band heads over to Europe where they will begin an extensive headlining world tour that will run from October 16th through November 16 and will feature SHINEDOWN and HALESTORM joining the band on select dates. ALTER BRIDGE will also make a triumphant return to Wembley Arena in London on October 18th, a venue they sold out on ABIII and documented with the CD/DVD, ALTER BRIDGE Live At Wembley.